Darjeeling , renowned all over the world for its excellent tea is the headquarters of the Darjeeling Gorkha Hill Council within the Indian state of West Bengal. 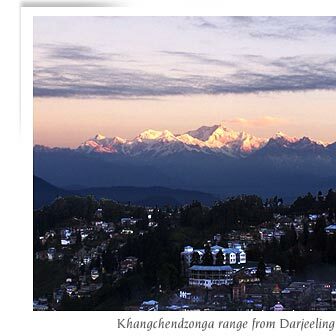 The name "Darjeeling" is a combination of the Tibetan words Dorje ("thunderbolt") and ling ("place"), translating to "The land of the thunderbolt." Darjeeling 's temperate climate led to its development as a hill station for the British Raj to escape the heat of the plains during the summers. Darjeeling is internationally famous for its tea industry and the Darjeeling Himalayan Railway, a UNESCO World Heritage Site. The tea plantations date back to the mid 1800s as part of a British development of the area. The tea growers of the area developed distinctive hybrids of black tea and fermenting techniques, with many blends considered among the world's finest. The Darjeeling Himalayan Railway connecting the town with the plains was declared a World Heritage Site in 1999 and is one of the few steam engines still in service in India . Darjeeling's excellent location overlooking a magnificent panorama of the Khangchendzonga range, offers visitors remarkable sceneries to view and its historical colonial background with setting with Gothic churches, British-style public schools and country houses adds a fairy tale impression to its setting.